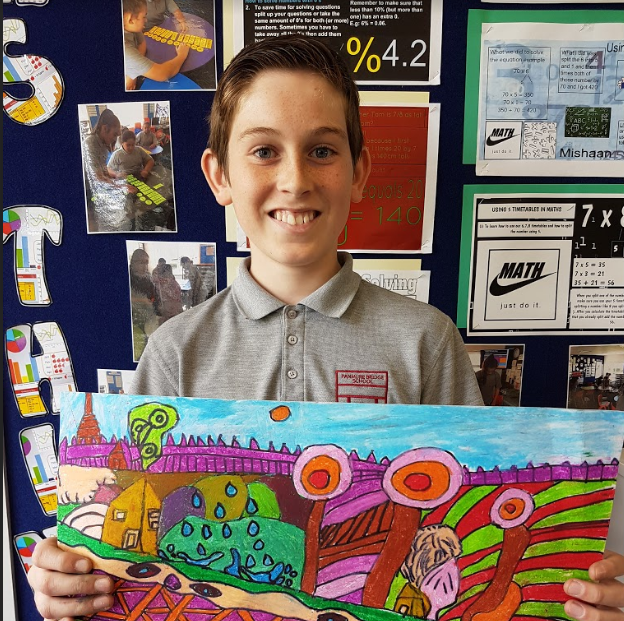 Latham : Hundertwasser Art Project. Today I completed my art project. 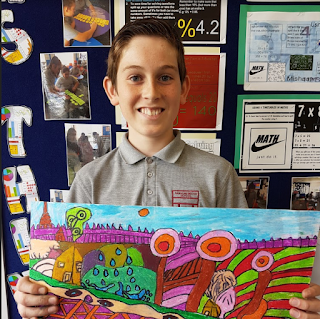 We based our art on an artist by the name of Friedensreich Hundertwasser. He was an Austrian man who made the hundertwasser toilets up north in New Zealand! My art includes 2 3D houses, rain drops, and a lot more! I have a challenge... Can you spot the 4 faces hidden somewhere in the picture? I look forward to doing more art projects like this! The Hundertwasser art was really cool looking in the end, wasn't it? I really liked the mixture of different colors that you used, it really looks brilliant. 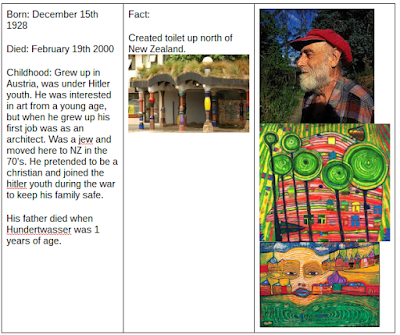 I really like how you included that little fact about Hundertwasser, that's pretty interesting how he made toilets even though he was an artist, but I suppose everyone has a hobby, even if they already have a job. I also like the contrast you used between hot and cold colours. Hopefully you keep blogging in the holidays on the Summer Learning Journey. Keep it up, especially over the holidays! Your art is very creative. Your hot and cold colours that you have chosen really makes half of your what is shown in your art. I could spot one face because half of the art was cropped out. We can keep in touch and blog over the Christmas holidays when we have left PBS. I really liked your Hundertwasser art piece. The art piece is really detailed and tells a story. And dont forget to keep up the great work Latham! I tried by best to recreate one of Hundertwassers pieces of art.